Saw the pinto family way to the south from the southwestern side of Round Top, so this afternoon I drove down the county road to hike in and find them. As it turned out, they found me. 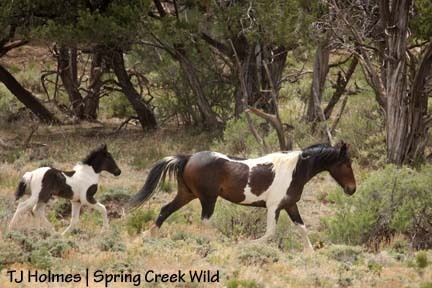 I was walking from some trees into an open area when Kiowa and Spook came trotting out of the trees to my left – toward me. I dropped my backpack and fumbled for my camera, and by the time I got it out, all the family members had caught up. That’s everyone above but Reya, who was just to the left behind a tree (from left: Chipeta, Shadow, Bruiser, Spook and Kiowa). They milled around for just a few minutes, then took off again. I’m still not sure of Spook’s gender, either. 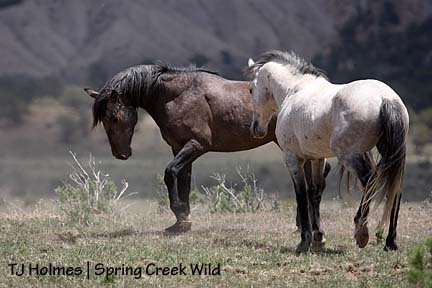 “Spook” was the name of a pinto stallion that was introduced to the herd several years ago. I had been told about him … but forgot. The name obviously stuck with me, though. 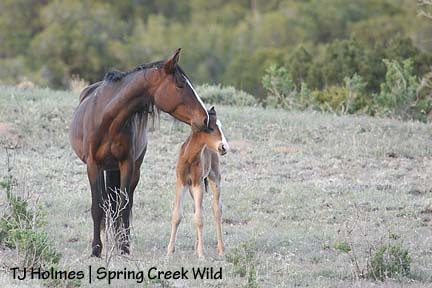 I told someone about the foal and naming it Spook, and she reminded me. Duh! Most assuredly related and carrying on. After they ran off, I kept walking. I had started to think I wasn’t going to find them and was on my way back to the county road. But then they surprised me again – they had stopped out in the next open area. Reya and Shadow at left, and Spook, Kiowa and Bruiser. Good things happen to those who walk up and down hills and through arroyos. 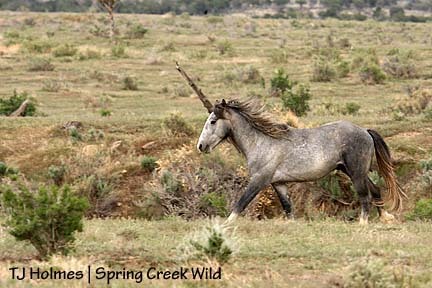 The basin is a magical place, but who knew we had unicorns!? I met photographer Pam Nickoles this weekend. 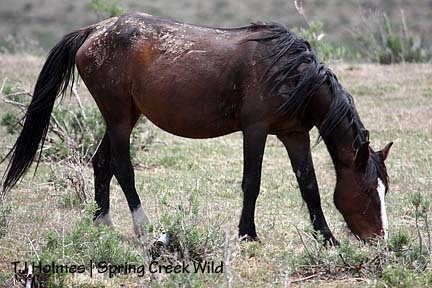 She and her husband, Tom, came down from Golden to see our Spring Creek Basin horses. 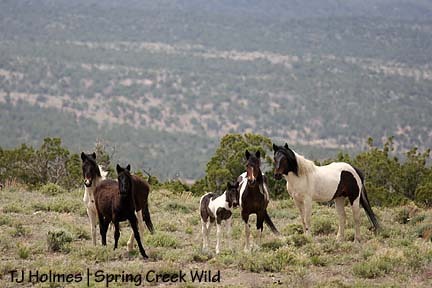 They’ve visited a lot of wild horses in places ranging from the Pryors to the Little Book Cliffs to the White Mountains in Wyoming to Corolla, Outer Banks, North Carolina. 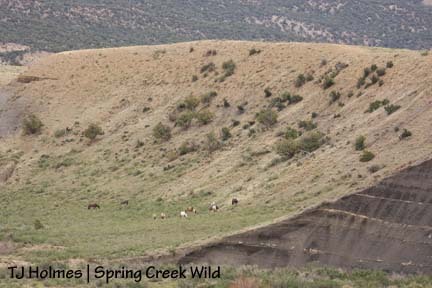 But they had never been to Spring Creek Basin. I had seen her Web site (http://www.nickolesphotography.com/index.html), and I contacted Pam and invited her to visit. 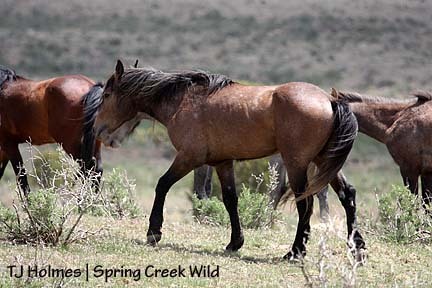 Despite the crazy weather, they were game to drive out to the basin this weekend, and I learned we have a lot in common in our philosophies about wild horses and photographing them. 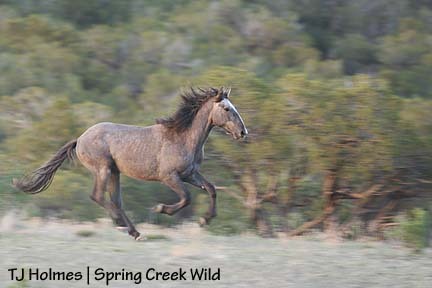 Pam has an awesome DVD out that pairs her gorgeous photography with music that celebrates our wild horses. 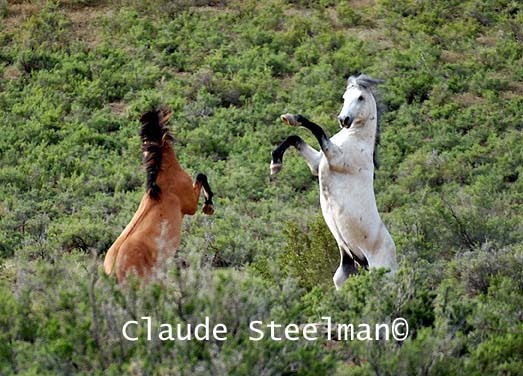 Shameless plug, but, like with Claude, I like to celebrate the people who are using their photography to raise awareness of wild horses and lend their special talents toward their protection. Pam and Tom got to see all the horses but the pinto family. Steeldust, lean and scarred and dogged by bachelors, was accommodating to visitors by being often by the road up in the northeastern area. Duke still is limping and alone, staying very near the northern-most intersection. The light wasn’t particularly nice to us, but with the horses so close to the road, we were able to get photos without bothering them much. Bounce, Alegre and Gaia were in an area I call “north park.” A small pond behind them does still have water. Right after we saw them, a law-enforcement officer for the BLM drove around and greeted us. I was happy to see him out there patrolling during the holiday weekend. He alerted us to Steeldust’s band farther around the loop. He had seen another vehicle, but we never saw another soul. Grey/Traveler and his family were near Steeldust’s band and the bachelors. Here, he was preening after a little chat with Mouse before he returned to his band. His family. It seems like Twister is growing right before my eyes. He’s still small, and his knee is still wonky. Alpha’s still pregnant. Luna and baby Ember and yearling Kestrel. Mama, baby, sister and half-sister. Luna and Ember – she’s a month old! 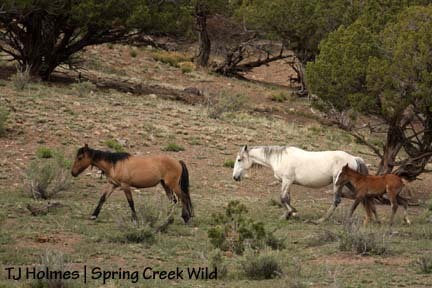 Mahogany and Pinon in some of the rare sunshine we had. 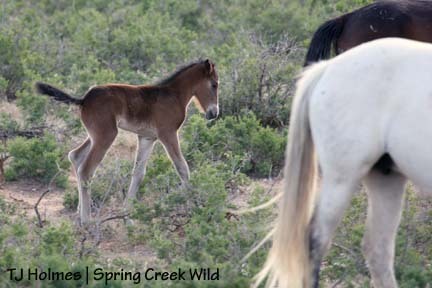 Pinon is a week old! Still haven’t definitively determined his (?) gender. I hope this is a PG-enough photo of Hollywood breeding Piedra. She’s in Steeldust’s band, but Steeldust was completely, totally, absolutely UN-interested in these goings-on. 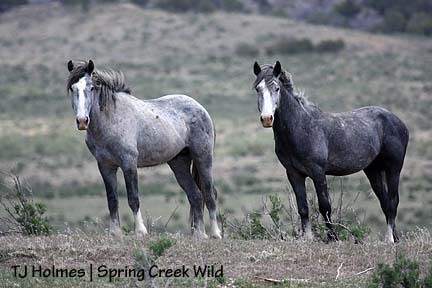 However, the two young rose-grey stallions, Butch and Sundance, were completely, totally, absolutely jealous. However … Piedra would have nothing to do with them. That’s Sundance above, showing what HE thinks about the goings-on! So, my theory: Piedra must be Steeldust’s daughter? Ember tried to get Pinon to play, but check out Mahogany. She walked over, and when she got close enough, gave a little ears-back flip of her head to Ember that sent her away. For you sharp-eyed folks, that’s just mud on Ember’s face. 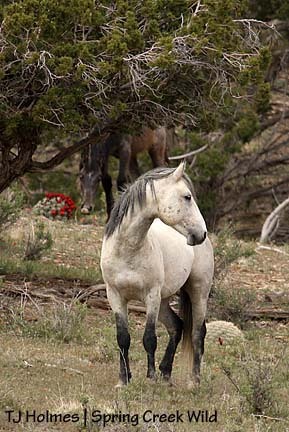 From the road, Steeldust chased one of the bachelors up a hill and into the trees. We also saw Poco, Bones and Roach, and they also were right – literally – on the road. There was a new comment about Bones’ hip when I got back this weekend – likely a fractured pelvis. Read it under the “Basin as world” post. Roach isn’t usually this animated! 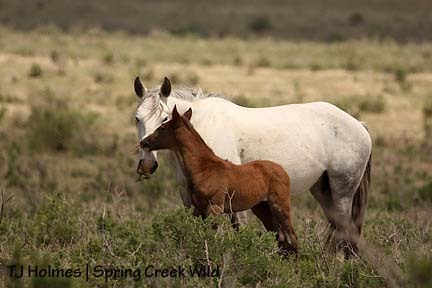 Claude Steelman came up with a beautiful name for Mahogany’s foal: Pinon. Very appropriate! Thanks, Claude! This panorama doesn’t do the basin any kind of justice, but that’s a lot of it, from a ridge high on the northeastern rim of Spring Creek Basin, above Horse Park. It’s a crazy steep hike, and I found out later that it’s in the wilderness study area, which is not cool because I drove to the base of the ridge on a well-worn doubletrack – unfortunately not signed. It’s definitely not something I’ll do again. 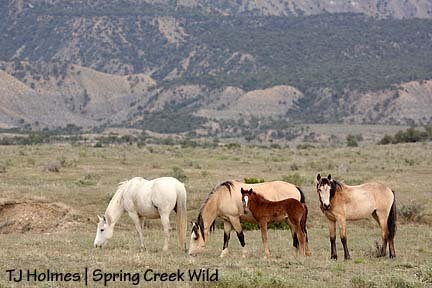 It’s not even the highest ridgeline surrounding the basin, and from the heart of horses’ home, it’s not something I could easily point out to you. It sounds like a terrible cliche, but it is true that a different perspective often gives you new appreciation. It’s context – I KNOW what’s down there – but looking at the whole, all I could think about was the details: each horse, every band, all their trails I’ve followed, their interactions I’ve been privileged to witness, the 3 feet of of snow this winter and the blooming paintbrush this spring. I know what’s there, and I’m in love with it all. 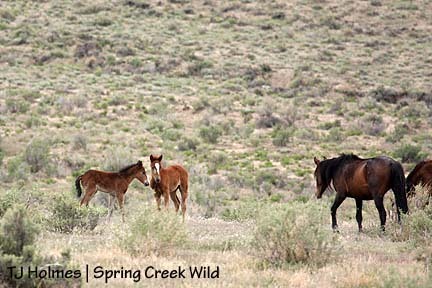 Friday morning, I hiked into the herd area from the county road, heading toward a big mesa/hill where the pintos sometimes hang out. Sometimes it works out to look for horses in familiar places, and Friday was one of those days. When I found them, I stood still, out in the open, and they were pretty calm. 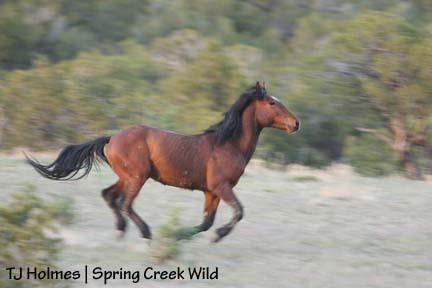 Then Kiowa started moving to the east, so I headed west, off the hill. 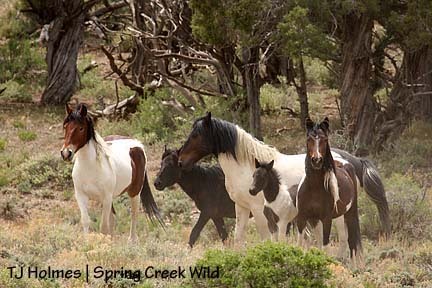 From left, Spook and Kiowa, Reya, Chipeta, Shadow and Bruiser. And then sometimes you spend a lot of time looking for particular horses in particular places, only to give up and find ’em right around the corner. Ya gotta find the humor in that. This is the arroyo on the northeast side of the roller-coaster ridge road. 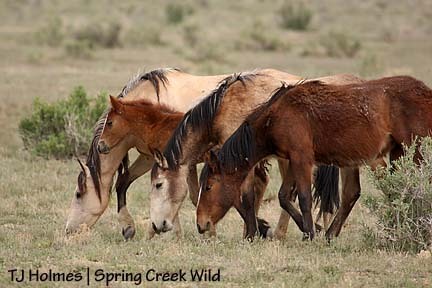 I had finally seen them out in the open – with Poco, Bones and Roach close but farther east. 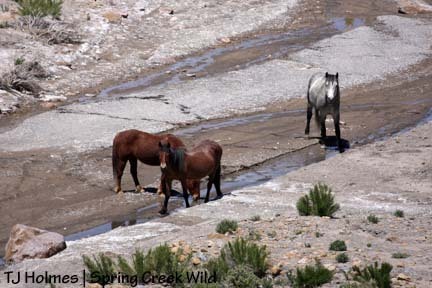 Despite the deep snow this winter, it has been a seriously windy spring, and water holes are dry and drying. A couple of them are already completely dry, and some others are rapidly shrinking. The water situation bears close watching. 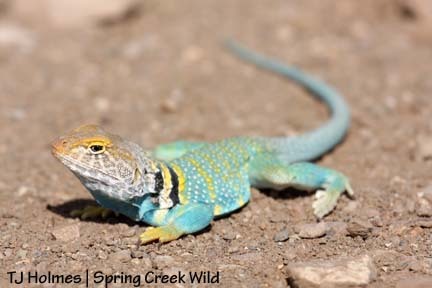 Male collared lizard. It was huge! It’s in the middle of the road here, and it’s one lucky lizard. 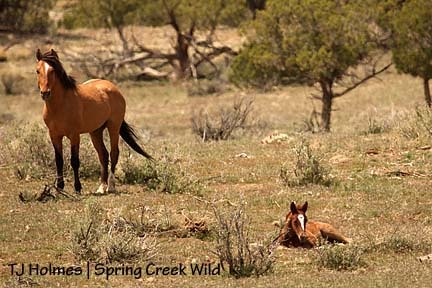 I don’t pay much attention to the road when I’m in the basin, being continuously on the lookout for horses. Of course, I’m usually a very careful driver! I don’t know if there’s such a thing as lizard harassment, but this guy came at me! Freaked me out, and that was the end of that photo session! Alpha girl, still pregnant … Such a pretty girl. What a doll! But notice his slightly swollen left hock. And check this out – maybe you’ve already noticed it – check out the little, darker splotch high up on his back, just behind his withers. See it? 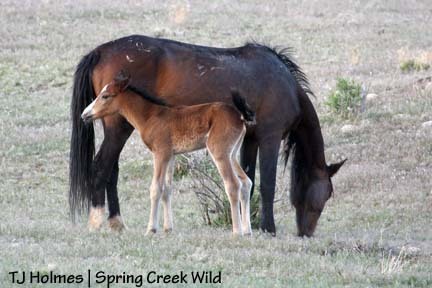 Last year, a bay filly was gathered that had a black splotch – like the splotch on a pinto, except she was otherwise bay. She was sent to Canon City, where she was named Hershey. 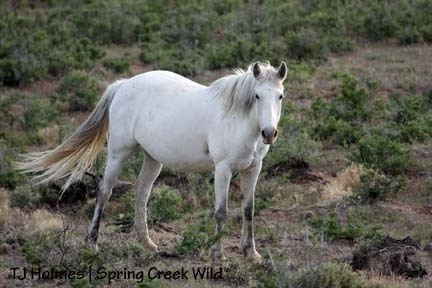 She was later taken to the Rocky Mountain Horse Expo (held in March, I think) in Denver and adopted. 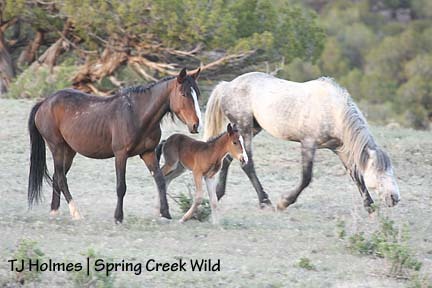 Claude Steelman has a photo of her coming down to the trap site with a grey stallion I think is Seven, her dam and another mare. The splotch isn’t genetic, apparently, but it’s weird to see it show up on another horse, yeah? 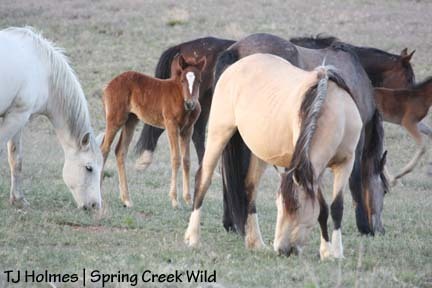 Baby nursing, Ember napping, Luna grazing, Piedra and Baylee hanging out. Steeldust and his band and the Bachelor 7 (minus Duke) were hanging out pretty close to the road near Wildcat Spring, so I parked and opened the door and just sat and watched. I had gotten out of the Jeep and was sitting on the ground right in front of it by a tree. Chrome was terribly, awfully curious. He’s a big boy, but he has a gentle personality. 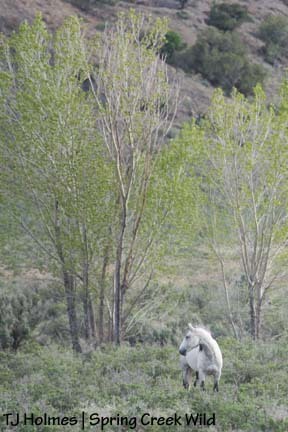 Aspen, there behind him, has a more dominant personality. But it wasn’t without drama. 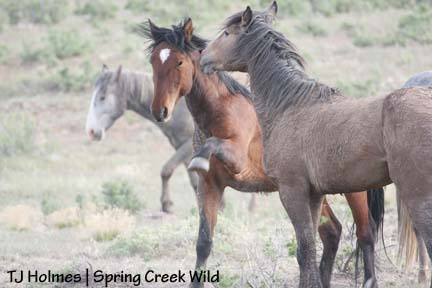 I didn’t notice much of a change in proximity of the bachelors, but Steeldust obviously did, and he came galloping over to announce HIS dominance. 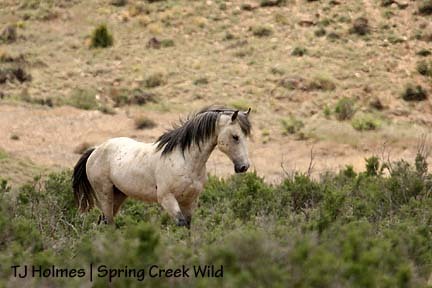 Grey/Traveler and his family were farther out in the open, near a wash that obviously gets enough moisture to grow cottonwoods. That wash is the same one University of Missouri students worked on this spring and last, cutting and spraying tamarisk. 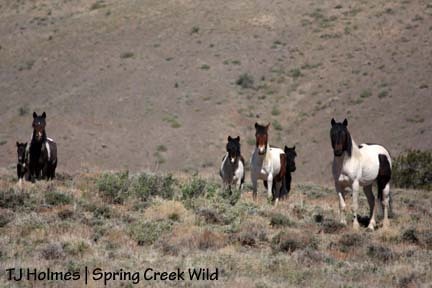 Grey kept his distance, but they did move out farther east. Meanwhile, the babies were down for naps. Mama Luna is there in the background, never too far away. While Grey and his family grazed out to the east, Steeldust’s family moseyed on up to the northwest, across the road and into the north hills, followed, of course, by the ever-hopeful bachelor boys. After they disappeared out of sight, I drove on. Duke was still in the same little green “meadow” where I had seen him Thursday evening. I didn’t go close to him at all, but he sure saw and watched me closely. I hope he’s healing because people who rode during the count didn’t see him limping. Claude said they never actually connected, but Traveler came galloping to challenge Hollywood. He has a lot worth defending these days. Aww, Mom! Not in front of company! 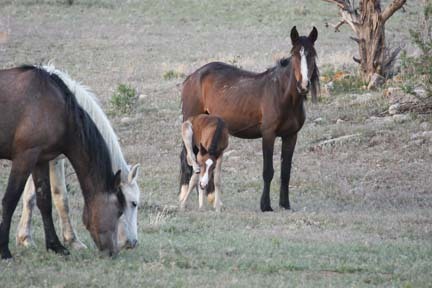 If you placed your bet for Mahogany to foal this week, you hit it right on the money. 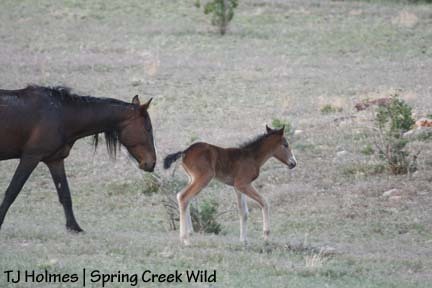 The bay girl has this beautiful “bay” foal (maybe a colt). Legs aren’t black, so I’m kinda expecting him to turn grey like Comanche, Mouse and Piedra … although all of them have black legs …? His left hock is slightly swollen, but he’s already dancing, so it doesn’t seem to bother him. Based on his level of balance, I’m guessing him to be about two days old here, which gives him a birthday of May 13. 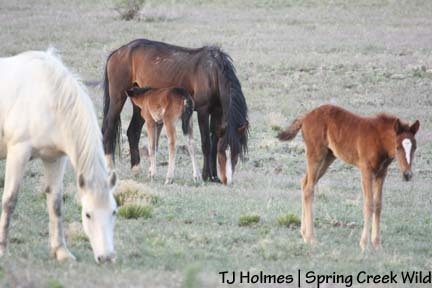 The Four Corners Back Country Horsemen’s annual spring count was this weekend, and I drove out Thursday to see the horses, participate in the count and write a story, both for my paper and for The Durango Herald. 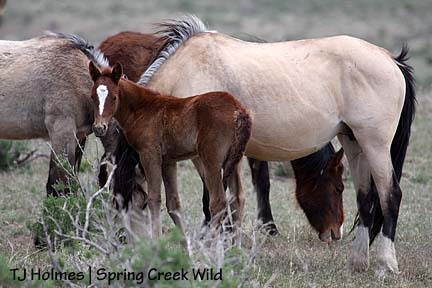 Durango photographer Claude Steelman was there already with Durango videographer Rich Fletcher, with Inside Durango TV, and they were photographing/filming the horses, who were grazing high up on the north side of the “finger hills” (just northeast of the dugout intersection). This pic was taken from the road, just north of the dugout intersection. 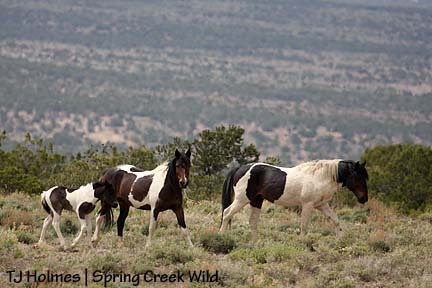 I had seen Claude’s vehicle from way back at the entrance to the herd area, and I had spotted Grey/Traveler and Houdini, shining like spotlights farther east on the north hills. I figured Claude’s vehicle was close to horses, but they were tucked away on this hillside, so it wasn’t until I was around the west side that I spotted them. Claude and Rich were below the road filming, and I didn’t want to risk causing the horses to move away from them, so I drove on around to where Grey’s band was grazing. I asked Claude to name the baby, as he was the first one to see him! A note: I got to preview Claude’s new book, which I’ve mentioned before on the blog. It comes out in August, and it’s just gorgeous. I cried, OK? Got to the first pic of my boy Grey inside and just burst out bawling with pride. (He’s also on the back cover! And there are several pix inside of him, too, including the glowing photo Claude took on the day he was released back into the wild.) 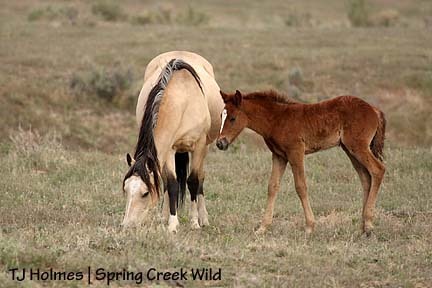 The book is titled Colorado’s Wild Horses, and it features photos of horses from every one of Colorado’s four wild horse herds. 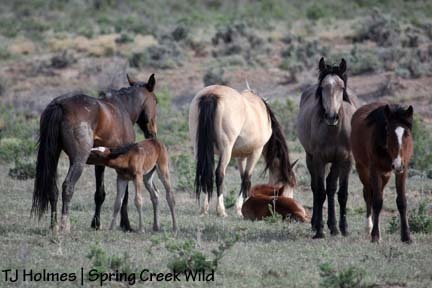 It also includes sections about gathers and adoptions, the training facility at the Canon City correctional facility where inmates train mustangs for the BLM, and interviews and portraits of people who have strong connections to wild horses. 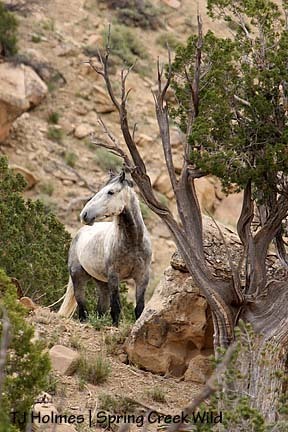 A Telluride poet contributed a spiritual poem, trainer Leslie Neuman contributed one that is sure to bring the tears and touch everyone’s heart, whether you’ve been privileged to touch a mustang or not, and Claude even overflows with verse in a wonderful poem at the end of the book. 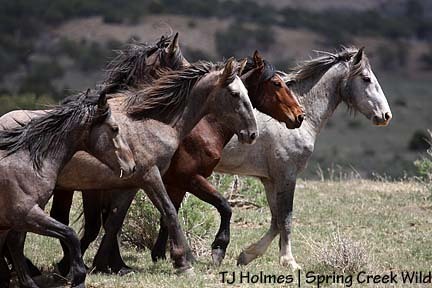 Consider this a shameless plug for my friend Claude and our magnificent wild horses, which he captures so beautifully with his camera! Check out his Web site – Wildshots – by clicking the link to the right under the blogroll. 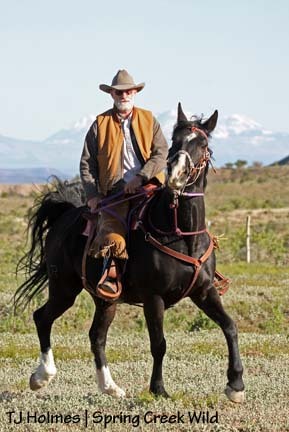 Rich left that evening, but Claude was out all weekend, and even rode a borrowed horse during the count! This pic was actually taken Saturday morning, as Claude and Tanglefoot, Kathe Hayes’ big Tennessee Walking Horse, were whizzing around the parking area at the corrals ready to go! Grey/Traveler had his band way to the eastern side of the north hills. He has been migrating ever farther that direction. Until this spring, I had never seen him that far east. There’s grass up there, though, and I think they’re still going back to the arroyo north of the finger hills for water. Here, he’s looking back at Jif, Houdini and Iya and Twister. Check out who’s playing peek-a-boo in the background. I drove on around the loop road and saw Alegre and Gaia and Bounce. Alegre’s being a great mama. They ran at the sight of the Jeep – she’s one of the ones that doesn’t like vehicles – so I waited for a little while, then went on. They had gone into the canyon north of the ridge I just learned the name of this weekend: Knife Ridge. Farther south, near the dry double ponds, Roach was standing in the middle of the road. Poco and Bones were just on the east side of the road. Bones was between Roach and Poco, and everything was calm until Roach nickered at Bones, which brought Poco flying. They scattered behind some trees, and I drove on. It had poured rain in Cortez earlier in the day, and the day was what I’d call mostly cloudy. Clear sky was waiting under the cloud bank to the west, though, and I figured it was just a matter of time before we got the gorgeous light (it was around 7-ish by then). 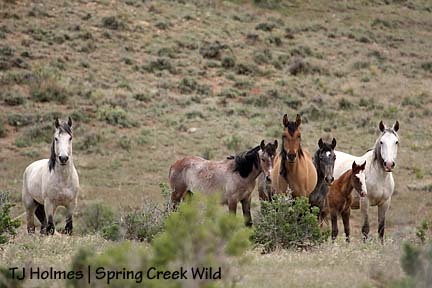 Seven and the girls were back in old stomping grounds south of the southeast loop road, and they stood quietly as I rolled past. 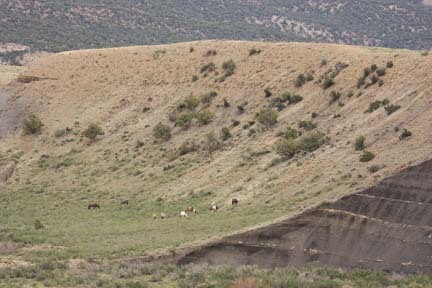 The *other* bachelor band was on the east end of the east-west hill that starts in the west with the finger hills: Corazon and Cinch, Ty and Mesa and David and the muley bay. Muley has a name, as of Saturday. Rachelle Davis, a member of the 4CBCH, said he looked copper. We were in the group of “walkers” on Round Top helping to spot horses, and the bachelors were right below us south of Round Top. So the muley bay is now Copper. I drove back around to Steeldust’s band. They were all up just to the west of the second intersection – with Duke. Duke has been by himself for three weekends now, and when I saw him on my first trip around, he was limping on his right hind. People who saw him Saturday said he was NOT limping or BARELY limping. He has been in the same place, so I guess he has food and water within easy reach. Steeldust’s band seems to come and go from his location. I hope his forced rest will heal whatever ails him and that he’s following after the band soon. The sun did fall out of the clouds, but the timing and location didn’t help me. But it also didn’t stop me from leaving the basin with a Cheshire-Cat-grin. What a beautiful day! This little guy is going to be a handful for mama, I think. I’m not sure if Mahogany was walking away or she was just following after baby, but Steeldust eventually went after them and “asked” them to return to the band. He doesn’t have any problem with balance! That’s Piedra and Alpha at left. Alpha, left, is still pregnant (bets?! 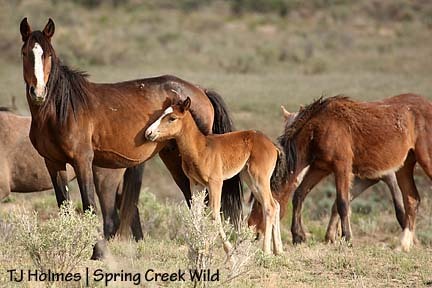 ), and Ember, right, is the oldest foal in the basin – now a month old. When the band headed down toward the intersection to go back out into the big valley, the bachelors went running. This is Aspen. The horses had some extra visitors Friday. The Ute Mountain Mesa Verde Birding Festival was being hosted at all kinds of places around the southwestern corner of our fair state, and a dozen or so people lucked out and went to Spring Creek Basin. Most of the Bachelor 7 were hanging out with Steeldust’s band, and Grey/Traveler’s family was fairly close. 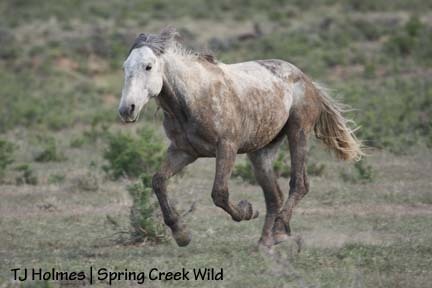 Not long after someone asked if it was normal for them to be so close, Grey went galloping over to challenge! We were still a distance away, but it was quite a show through the binoculars. Steeldust and his band and hangers-on moved away, closer to the road that goes by the base of the north hills. That’s where we stopped to watch as they napped. After the birders left, I sat in the Jeep for a while and made notes until the horses moved around the hill. I thought they were leaving the road – until I drove on and realized the road also went around the hill. Some folks say vehicles make good blinds. Sometimes yes, sometimes no. Some of the horses really hate vehicles – Duke, in particular. Speaking of Duke, I think I confused them last weekend. They both have stars, but Duke has a left hind fetlock. Duke is a rich, mahogany bay, and Aspen … is shedding out a rich, mahogany bay. In his winter coat, he looked red-bay. 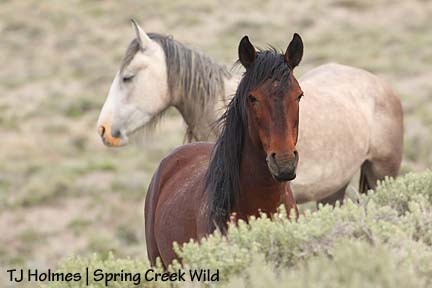 While I was watching the horses with the birders, one of their guides, Mike Jensen, who used to manage the herd, spotted Duke up on a hillside just north of the group. We could easily see his fetlock. I didn’t see the three bachelors I thought were Duke, Hook and Chrome real close last weekend, and now I wonder if “Duke” wasn’t Aspen. 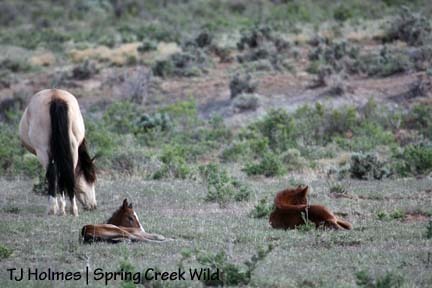 Things like this remind me identifying wild horses isn’t an exact science! Da boys. 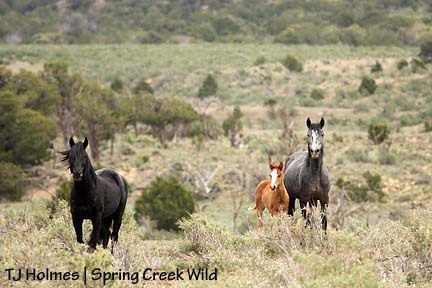 In this photo, definitely, are Comanche, Hook, Mouse (his ears), Aspen and Chrome. Chrome, left, and Kreacher. 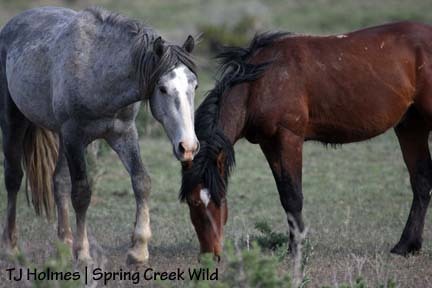 Chrome is shedding out lighter this spring. At one point, Kreacher went flying by with Hollywood hot on his heels. Their interaction ended with flying heels – Hollywood’s – but no connection. In this image, you can clearly see by their body language that Hollywood is the dominant horse and Kreacher is submissive. 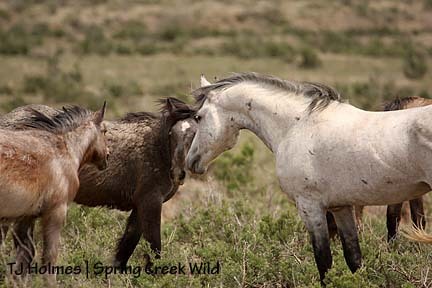 Meanwhile, Grey snuck up again, and here he’s having words with Comanche, who immediately turned and went back to his boys. Grey went right back to his family. Place your bets now on this girl’s due date! She has gotten round in just the past couple of weeks. Who can resist this little sweetheart? When I first aimed my camera in her direction, she wasn’t looking at me. A few seconds later – with her still in my viewfinder, she looked my way. Cute! Mouse seems to be doing OK. 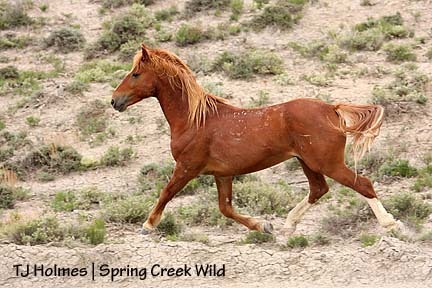 I saw him go into a trot only once, and only for a few steps, but he doesn’t seem to be limping. It was his right front and here, he looks pretty solid on it. Grey/Traveler checking out his “stepkids.” Twister is still doing the baby chewing, but I didn’t see Two Boots doing it this time. He has some new scars, so I’m sure there have been some encounters between him and the bachelors, at least. I haven’t seen him interact with Steeldust – or vice versa – which may be just timing (mine) or something else. Two Boots hanging out with Jif. 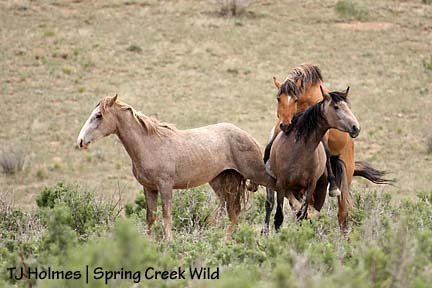 It seems like the young horses take the longest to shed out. 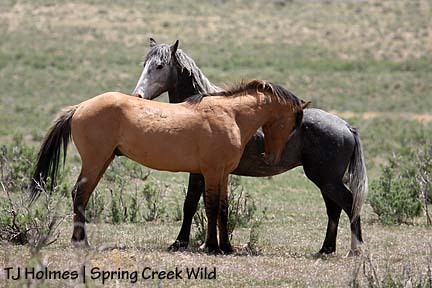 After his confrontation with Comanche, Grey settled into guardian status, and although Steeldust ended up crossing the road not far from Grey, they stayed in separate groups. 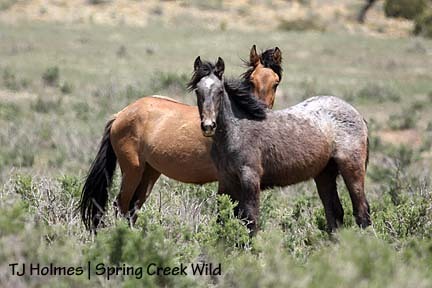 I took advantage of their proximity to take some pix of Houdini and Iya – and confirmed Iya as a filly. 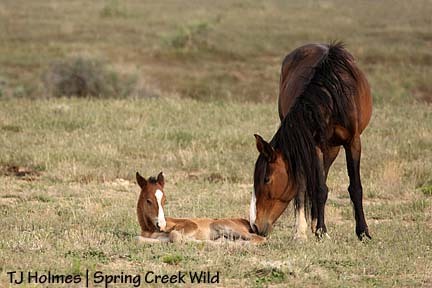 All the horses in a band seem to take special care around the foals, and it was really cool to see Hollywood demonstrate that care.